Note: The current avian flu is H5 N1 - a very different strain. The Allies of World War 1 frequently called it the Spanish Flu. 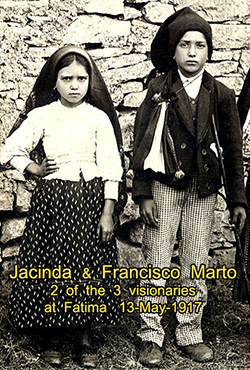 This was mainly because the pandemic received greater press coverage in Spain than the rest of the world, because Spain was not involved in the war and there was no wartime censorship and was the first to report the epidemic. In Spain, they called it the "French Flu"
It was also known as "only the flu" or "the grippe" by public health officials seeking to prevent panic. The belligerents squashed news of the outbreak so the enemy will not find out about their weakness. The first recorded European epidemic was in 1173-1174 although the first generally agreed pandemic occurred in 1580. Since then there have been 31 documented pandemics of cough, shivering, aching pains and sweating; all symptoms suggestive of flu. It is impossible to establish the early history of flu as it was so little understood until the mid 20th century. Also, reparatory infections would have been secondary to other deadly infectious diseases such as plague, smallpox, typhus and measles. There were two pandemics in the 19th century, 1847-48 and 1889. Why was the 1918 Spanish Flu the deadliest? All flu viruses are thought to have originated in birds. Scientists also think that to cause human epidemics, the virus had to jump from birds to pigs, where the genetic changes occur to enable the strains to spread in mammals (humans). Different influenza strains spread around the world annually. Every so often, a strain tough enough to kill millions emerges. Experts believe the world is overdue for another pandemic. Unravelling what made the 1918 Spanish flu so vicious could help doctors' better react if a similar strain returns. Asia's current bird flu, a strain known as H5N1, clearly can jump from poultry to people. Most cases have been traced directly to contact with sick birds, although human-to-human transmission has not been ruled out in some instances. New research by scientists using lung samples preserved from victims of the 1918 flu, a llowed the reconstruction of the hemagglutinin protein, present on the surface of the flu virus, which allows it to attach to and penetrate lung cells.Hemagglutinin from human and bird flu viruses interact with different cell receptors, which is why birds infecting people is rare. However, the new studies show the structure of the hemagglutinin from the 1918 flu changed to make it capable of attaching to human cells. In doing so, it retained the features found in avian viruses, not human or pig strains. Influenza is usually a killer of the elderly and young children. 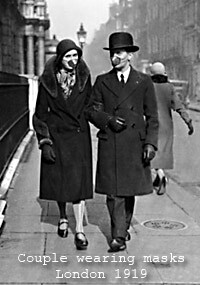 However, the Spanish Flu was most deadly for people aged 20 to 40's. This is thought to have occurred because the immune system of the young and elderly is weakened and cannot easily fight the virus. People aged 20 to 40 are in the prime of life. Their bodies reacted, or in fact over-reacted, to the unknown 1918 virus, causing the lungs to fill with blood from burst blood vessels and in fact death was by drowning in one's own bodily fluids. The first true victim or the 1918 Spanish Flu has been lost to history. Some experts believe the virus originated in China- birthplace of many flu strains. 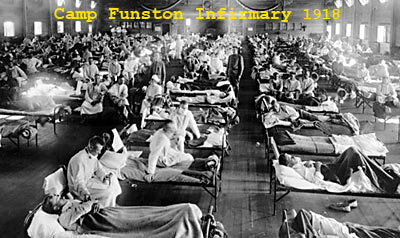 Shortly before breakfast on Monday, 11 March 1918 the first recorded case of Spanish Flu occurred when Company cook Albert Gitchell reported to the infirmary at Camp Funston, Fort Riley, Kansas.He complained of a "bad cold". Immediately behind him came Corporal Lee W Drake with a similar complaint. By noon, Camp Surgeon Edward R Schreiner had over 100 sick men on his hands, all apparently suffering the same symptoms. Within five weeks, 1,127 people would be infected and 46 would die. Fort Riley was a sprawling establishment housing 26,000 men within its 20,000-acre boundaries. The winters were bone-chilling cold - the summers sweltering. Sandwiched between these two extremes were blinding dust storms. Within the camp were thousands of horses and mules that produced a stifling 9 tons of manure each month. Disposal of the manure was by burning, often made more unpleasant by the driving wind. Like most army camps, it bred its own swine and poultry for consumption. In April and May soldiers at Camps Hancock, Lewis and Sherman came down with the same ailment. Over 500 prisoners at San Quentin, California also fell ill. Influenza spreading among men living in close quarters did not alarm public health officials at the time. 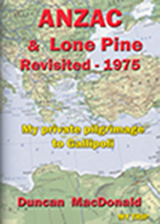 Little data existed to indicate any sizable spread among the civilian population. Besides, the nation had bigger matters on its mind - it had a war to win! In March 84,000 American 'Dough-boys' set out for Europe. They were followed by another 118,000 in April 1918. Little did they know they were carrying with them a virus more deadly than the rifles they carried. While sailing the Atlantic, the 15th US Cavalry incurred 36 cases of influenza, resulting in 6 deaths. By May, the killer flu had established itself on 2 continents and was spreading spectacularly. The influenza of 1918 showed no bias in its approach to the combatants in World War I. Men from all sides sickened and died. Great Britain reported 31,000 flu cases in June alone. By early summer, the flu had spread beyond the U.S. and Western Europe. 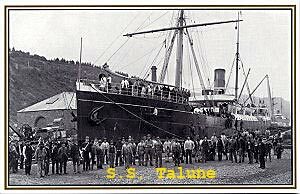 Numerous cases were reported in Russia, North & South Africa, South America and India- which suffered one of the worst mortality rates with over 17 million dying after infected troop ships returned home. The Pacific Ocean provided no protection as influenza spread to parts of China, Japan (with one of the lowest mortality rates), the Philippines, Australia and New Zealand.By July, the Spanish Flu of 1918 had infected millions and tens of thousands had already died. This first wave was but a prelude. During the autumn, it would mutate and reappear in full devastating force. 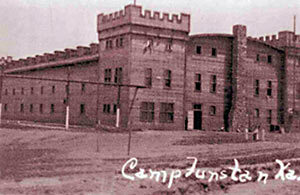 March : First reported case at Camp Funston, Kansas. News of the war dominates headlines and after a few weeks, the flu epidemic abates and most Americans believe the worst is over. 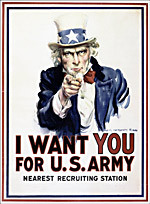 April to June : Thousands of infected American troops pass through the east coast exit ports and sail to the fighting in Europe. When they land in France, the virus spreads across the continent, infecting hundreds of thousands of civilians and combatants alike. July : Public health officials issue a bulletin about the so-called Spanish Influenza. August : The second wave of the virus mutates hits Europe hard. Troop and supply ships spread the disease. Sailors stationed on board the Receiving Ship in Boston Harbour begin reporting sick with flu-like symptoms on the 27th. By August 30th over 60 sailors were sick. Flu sufferers commonly described feeling as if they "had been beaten all over with a club." 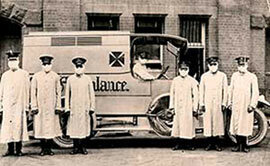 Within 2 weeks over 2,000 officers and men of the First Naval District had contracted influenza. In the latter part of August 1918, somewhere in western France, the virus mutates and becomes highly toxic. September : Dr Victor Vaughn acting Surgeon General of the Army, proceeds to Camp Devens near Boston. What Vaughn sees changes his life forever: "I saw hundreds of young stalwart men in uniform coming into the wards of the hospital. Every bed was full, yet others crowded in. 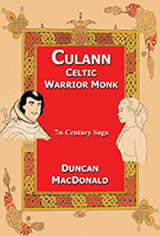 The faces wore a bluish cast; a cough brought up blood stained sputum. In the morning the dead bodies are stacked outside like cordwood." On the day, Vaughn arrived at Camp Devens, 63 men died from influenza. 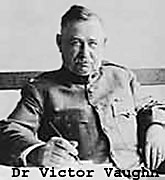 Vaughn, a former president of the American Medical Association, stated, "This infection, like war, kills the young, vigorous, robust adults. The husky male either made a speedy and rather abrupt recovery or was likely to die." He stated that the world was lucky the 'Spanish Lady' hadn't claimed even more victims. He pointed out that doctors of the day "knew no more about flu than the 14th century Florentines had known about Black Death". The Navy Radio School at Harvard University in Cambridge reports the first cases of flu among 5,000 young men studying radio communications. On September 5 the Massachusetts Department of Health alerts area newspapers that an epidemic is underway. US Surgeon General Rupert Blue dispatches advice to the press on how to recognise the influenza symptoms. Blue prescribed bed rest, good food, salts of quinine and aspirin for the sick. Lt. Col. Philip Doane, head of the Health & Sanitation Section of the Emergency Fleet Corporation, speaking in Washington DC, fuels the rumour and speculation by blaming the Germans for the deadly influenza that was striking Americans. "It would be quite easy for one of those German agents to turn loose Spanish influenza germs in a theatre or some other place where large numbers of persons are assembled. 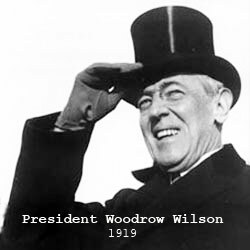 The Germans have started epidemics in Europe and there is no reason why they should be particularly gentle with America." said Doane. 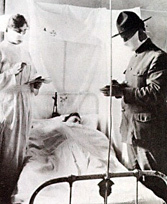 Dr William Hassler, Chief of San Francisco's Board of Health, predicts Spanish flu will not reach the city. On 24th September Edward Wagner, a Chicagoan newly settled in San Francisco, falls ill with influenza. On 28th September, 200,000 gather in Philadelphia for a 4th Liberty Loan Drive. Days after the parade, 635 new cases of influenza were reported. Within days, the city was forced to admit that epidemic conditions exits. Churches, schools and theatres are ordered closed. Royal Copeland, the Health Commissioner of New York announces, "The city is in no danger of an epidemic. No need for our people to worry." October : Boston registers 202 deaths from Spanish flu on 2nd October. The city cancels its Liberty Bond parades and sporting events. 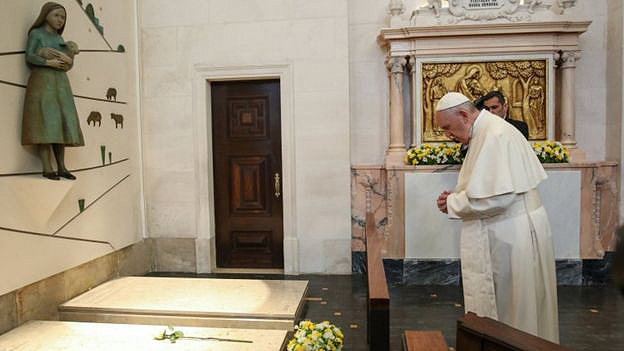 Churches were closed and the stock market was put on half-days. On October 6th Philadelphia posts the first of several gruesome records for the month: 289 influenza related deaths in a single day. Congress approves a special US$1 million fund to enable the US Public Health Service to recruit physicians and nurses to deal with the growing epidemic. US Surgeon General Rupert Blue sets out to hire over 1,000 doctors and 700 nurses. Many medical professionals are already engaged in providing care to fighting soldiers. Blue was forced to look for recruits in old-age homes and rehabilitation centres. 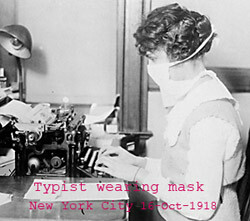 851 New Yorkers die from Spanish flu in a single day. In Philadelphia, the city's death rate for one single week is 700 times higher than normal. The crime rate in Chicago drops by 43%. Authorities attribute the drop to the toll that influenza was taking on the city's potential lawbreakers. November : To mark the end of World War 1, 30,000 San Franciscans took to the streets to celebrate. There was much dancing and singing. Everyone wore a face mask. Sirens wail on November 21, signalling to San Franciscans that it is safe - and legal - to remove their protective face masks. At that point 2,122 were dead from influenza. New Zealand Expeditionary Force: As in the SARS epidemic, (SARS is also causes by a virus)some outbreaks of Spanish flu can be traced to a single person. A transport carrying 1,150 troops from New Zealand anchored off Freetown, Sierra Leone. Influenza was raging on shore and on some British warships nearby. Unwisely a conference of ship's captains was called on one of them. In all, there were 900 serious cases and 83 deaths. Brevig Mission, Alaska had a population of 84 in 1918. In November 1918, it lost 85% of its population to Spanish flu leaving only 13 children and teenagers. In February 1998, The Molecular Pathology Division of the US Armed Forces Institute of Pathology recovered samples of the 1918 influenza from a frozen corpse of an Inuit woman buried almost eight decades in the permafrost at Brevig. This was one of four recovered samples containing viable genetic material of the 1918 virus. This sample provided scientists a unique opportunity to study the virus and determine it was avian flu H1N1. Without orders from the government but based on what he learned from a radio news service, the Governor of American Samoa, Navy Cmdr. 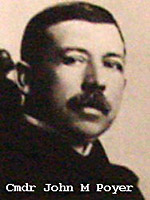 John M Poyer, instituted a quarantine policy. When he head of the outbreak on Western Samoa, he banned travel to or from the neighbouring islands, which were about 60 kilometres apart. 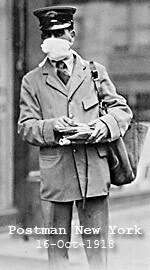 When the Governor of Western Samoa, Lt Col. Robert Logan, sent a boat with mail to American Samoa to be put on the itinerant mail boat docked there, Poyer refused even to allow the bags to be transferred. Enraged, Logan temporarily stopped all radio communication with the American islands. Poyer persuaded the island's natives to mount a shore patrol to prevent illegal landings. People who disembarked from ships sailing from the American mainland were kept under house arrest for a specified period or examined daily. Aspects of the quarantine continued into 1920, a year after Poyer departed to the sound of a 17-gun salute. Many cities states and countries enforced restrictions on public gatherings and travel to try to minimise the epidemic. In many places, theatres, dance halls, churches and other public gathering places, were shut down for a year. Quarantines were enforced with little success (except for American Samoa - see above, and Iceland).Some communities placed armed guards at the borders and turned back or quarantined any travellers. One US town even outlawed shaking hands (in hindsight a wise move). Some communities closed all stores or required customers not to enter, but place their orders outside the store for filling. There were many reports of places with no health care workers to tend the sick because of their own ill health and no able-bodied morticians or gravediggers. Mass graves were dug by steam shovel and bodies buried without coffins in many places. • Guillaume Apollinaire, French surrealist poet . The Spanish flu was unusual in killing mostly many young and health adults, as opposed to more common influenzas that cause most mortality among newborn and the old and infirm. People without symptoms could be struck suddenly and rendered too feeble to walk within hours. Many would die the next day. Symptoms included a blue tint to the face and coughing up blood caused by sever obstruction the lungs. In further stages, the virus caused an uncontrollable haemorrhaging that filled the lungs. Patients would drown in their own body fluids. Some 200,000 were killed in Britain and more than 400,000 in France. The death rate was especially high in indigenous people, where some entire villages in Alaska and southern Africa perished. Fourteen percent of the population of Fiji Islands died in a period of only 2 weeks. By July 1919 257,363 deaths in Japan were attributed to influenza, giving a mortality rate of only 0.425%, much lower than all other Asian countries for which data is available. 4. Cox NJ, Subbarao K. Global epidemiology of influenza: Past & present. Annual Review of Medicine 2000; 51: 407-421.